Picture this perfect nuptials scenario. Driving from Colombo into the 400-year-old walled locale of the Galle Fort. 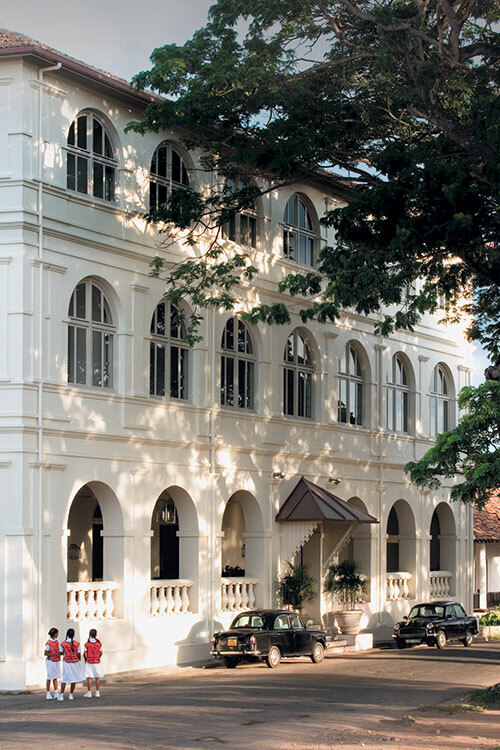 Stepping past the pristine white façade of Asia’s oldest running hotel, Amangalla, which faces a bustling road outside and is an oasis of sophisticated serenity within. 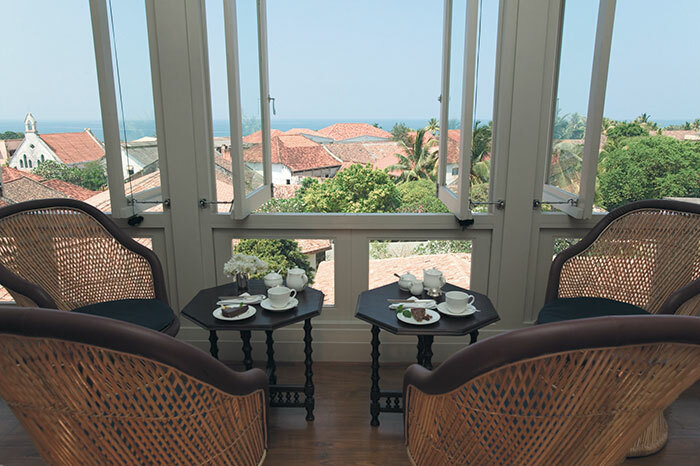 Guests refresh themselves with tambili juice and then unwind in the 29 spacious rooms that boast jackwood floors, four-poster beds, period furniture and sprawling verandahs. The two-storey garden house is being adorned with white lotus flowers and scented candles in preparation for the upcoming wedding night. The bride and groom begin their preparations at The Baths, Amangalla’s hydrotherapy spa. He opts for a traditional shave and massage in the quaint barber’s shop while she enjoys a herbal steam followed by a cream wrap. The couple then spends a leisurely hour in the waters, alternating between the therapy pool, cluster spray jets, sauna and icy plunge pool. He follows up with a foot massage and cocktail on his sun bed as she finishes with a polished manicure and pedicure. The guests are equally pampered; yoga sessions, body buff treatments and luncheon in the tree-lined garden get them ready for an evening of celebration. It’s time to get the show on the road. Decorated vintage cars and local tuk- tuks line the street along with a ceremonial elephant; family and friends travel in style to the Anglican Church of All Saints a few yards away (The Amangalla also organises civil ceremonies within its premises). Canapés and mango bellinis welcome the newly married couple on their return. 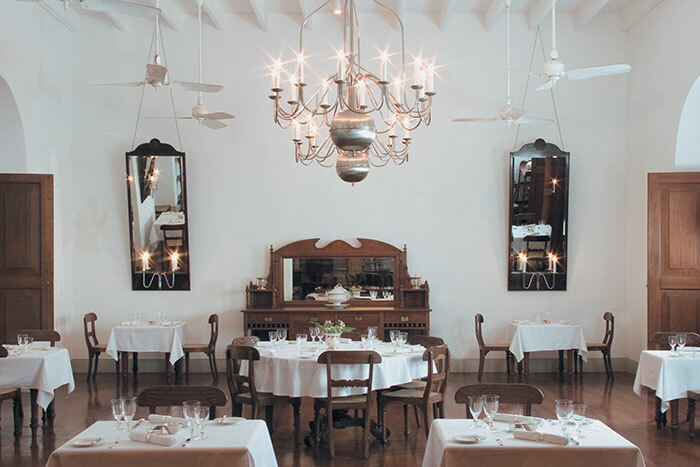 Depending on choice, the reception begins in the pool courtyard or the Zaal dining room; the former offers a pleasant outdoor ambience with cemented cabanas and lush foliage while the latter showcases a grand indoor platform of rich furnishings and opulent chandeliers. Rice confetti, hydrangea blossoms, frangipani centerpiece decorations, lotus in silver bowls, tea lights hanging on tree branches and oil lamps on tabletops set the stage for a truly elegant evening. The hotel has arranged for a photographer and videographer to capture the special moments for posterity. The night begins on a mellow note, with soothing piano or tabla performances, or even a peppier jazz band. A sumptuous dinner follows – guests are treated to a typical Sri Lankan feast of seafood curry, chicken badum, brinjal moju, tempered potato and fried baby shrimps or a more western selection of roast pumpkin soup, crab cakes, grilled seer fish, braised lamb shank, tuna carpaccio and woodland mushrooms. While the dessert menu comprising caramelised apple tart, toffee ice cream and vanilla cream puffs with hot chocolate sauce is irresistible, one must partake of a generous slice of wedding cake as well(either a classic fruit layered concoction, tiramisu or strawberry gateau). The real party is slated to begin as the DJ hits the stage with the couple’s favourite remixed numbers. As the people saunter back into their rooms, the newly married couple strolls to The Garden Villa, their haven of calm in the middle of the greens, overlooking the poolside. Sometimes, marriages are made in a heaven called Aman. 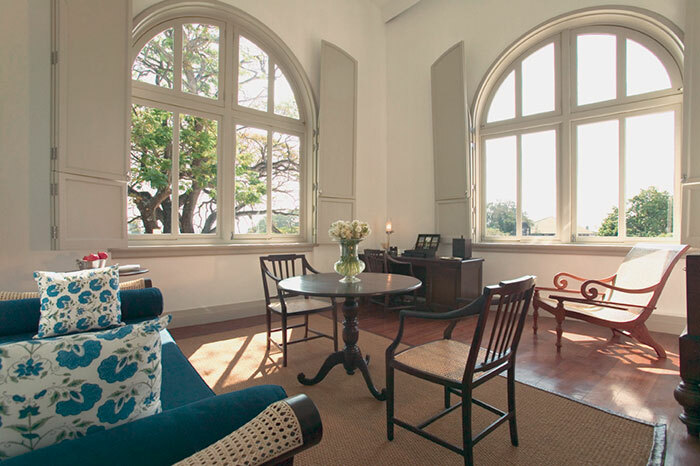 10 Church Street, Fort, Galle, Sri Lanka. Tel: (94) 91 2233388.